I couldn’t help thinking as Tracy Cotterell was preaching on Sunday and mentioning the sudden and unexpected storms that could descend on Lake Galillee, of the cold snap and travel chaos which descended on Buckinghamshire last week, or the political squalls that continue to buffet our nation. However, it was the journey from faith to fear which came across most strongly – I would advise you to listen to this sermon if you haven’t had the chance – it will be on the website. This Sunday I am delighted to once again welcome a dear friend of the Minster, Hassan John, from Jos, Nigeria. He will be preaching, but also giving us a personal update on where our gifts have gone to support football teams, the repair of their tent-church, burned by terror groups but now fully repaired after a gift from Latimer Minster, and a new sound system. I love that we are a global church and a global people – able to bring real love and practical support from one end of the globe to the other. As we have given financially, I fully expect us to receive spiritually as we gather together on Sunday in our tent – though in slightly colder conditions! The first followers of Jesus described themselves as ‘followers of the Way’ or ‘followers on the Way’ – and of their faith as a journey of following Jesus, the Way, truth and the Life. To say I am on my way – means we are already progressing from A to B – we are moving. It is a dynamic analogy or metaphor of what it means to be a Christian. As I mentioned in a sermon a few weeks ago, I met a man who was lost, stumbling around at the crossroads by Stampwell farm, and he had to stop, and ask me for the right way. In our era of sat navs we have forgotten how to set out on a journey and stop and ask for directions at key crossroads. I think that we are potentially at an important cross-roads moment in the life of our church, but perhaps also for the nation as a whole. The political turmoil is a sign of confusion for our country – our politicians and our electorate cannot convincingly make their minds up at this fork in the road surrounding the nature of our involvement in Europe. But there is another reason to sometimes stop, look and listen – not just asking for directions at the crossroads, but also pausing so we can cross over safely in the same direction, but with perfect timing. One of the first BBC micro computer games was called Hopper – a small pixelated frog had to cross the road filled with lanes of traffic without getting painfully squished. There was also an old safety video that ran on children’s TV, back when there were a few TV channels and no streaming (the Stone Age! 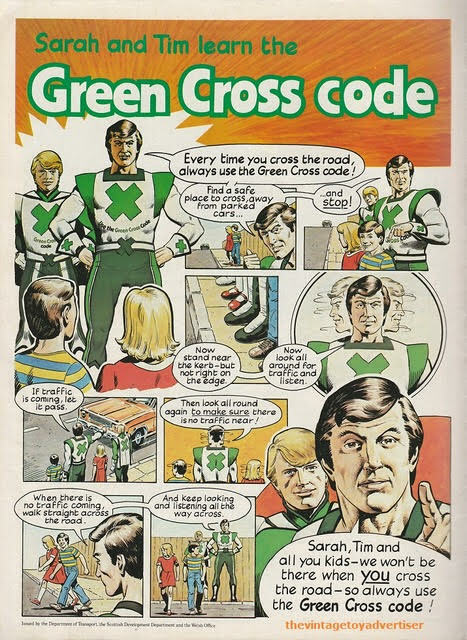 ), where children were encouraged to know their “green cross code” – the way to cross a road. 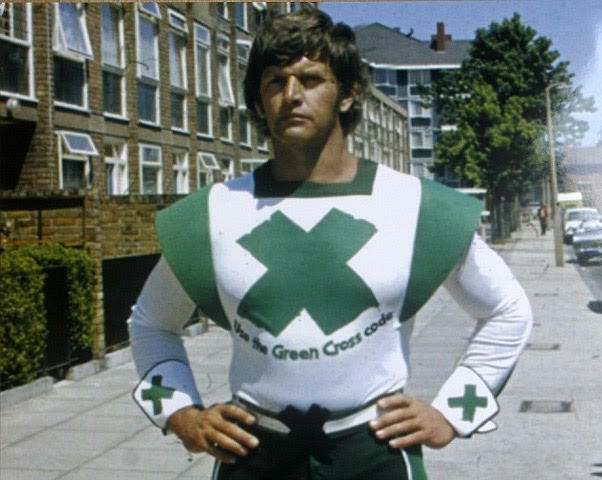 There was little poem, some top tips, and a man with a lurid super-hero costume. Children were told to “STOP, LOOK, LISTEN” – or to look left, right and left again – and then to cross safely. In a way, the prophet Jeremiah is saying something similar – sometimes it is good to stop, look and listen, and this will help us…stay alive! It is part of safe and responsible road awareness that means that all children must learn how to cross a road. When we are smaller, and less aware, we chase whatever is in front of us – the football rolls out into the street and suddenly lives can be lost. Road safety is about realising that sometimes it is right to pause, to look, listen and then we crossover together when we know it is safe to cross. Disciples are Children of the Living God, learning from our father about how to be followers of the Way – asking at key crossroads, and, led by the Spirit, pausing or moving forward with perfect timing. Over the next few weeks in this weekly email I intend to explore what the real ancient ways might be for us, and it is a subject of concerted prayer for many in the church right now. But until then, there is a simple thought – I believe the Lord wants us to stop, listen and spend some time seeking his specific direction for our lives personally, together, and also as a church in a confused generation. This will not be forever, but I am hoping and praying that we will use this time to grow in friendship with each other, grow in our ability to hear from God through the gifts of the Spirit, and to begin to move forward, when the time is right, but as a whole, unified community. No solo frogs running into the traffic with us!!! I also have a small update to give on the planning. The council took their sweet time in publishing the minutes from the planning meeting in November where they rejected the application for the renewal of Stampwell farm, including the building of a church and some cottages, and these minutes were finally released about two weeks ago. We could not take any steps until these had been published. I am therefore meeting with Bidwells and Briggs & Stone this week and will be arranging a visit by one of their consultants after church as soon as there is availability. When I have a date confirmed I will, of course let you know. We do not intend to take the response from the council as the end of the matter, and there will be a process of amendments and appeals through the spring, which will make the outcomes clearer. While this continues I would be most grateful for your continuing prayer and support. As a church and charity we haven’t been asked to fund any aspect of the planning application, and we have focused our giving on day to day ministry, staff salaries, services and utilities. If you would like a financial update of the church finances and didn’t receive one by email from Jane at the end of 2018, then please do email jane.overnell@theminster.org. It was sent to those who we have on record as regularly giving to the minster, but is also available on request from Jane. Just to remind you that there is no Encounter: Worship this Sunday evening.